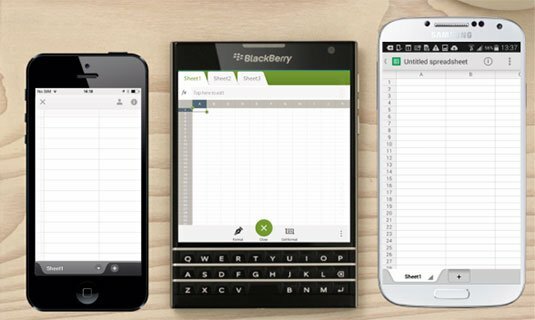 BlackBerry's forthcoming Passport handset may look odd at first glance, but the company claims it had good reason to break with traditional smartphone designs for its latest, square-shaped device. "We've been living in a rectangular world for quite some time and know it's a great ergonomic design that drives content, media consumption and quick communications," BlackBerry's Matt Young wrote in a Monday blog post. "However, the rectangle has become a de facto approach to smartphone design, perhaps limiting innovations." The Passport – which features both a physical keyboard that doubles as a swipe navigation device and an unusual, 1440-by-1440 resolution touchscreen – isn't due to ship until September, but its look has already been described in terms ranging from "striking" to "weird." But according to Young, the decision to go with a square display was less about turning heads and more about making it easier for people to get actual work done on their phones. By way of visual demonstration, Young's post included a photo of a Passport alongside an iPhone and what looks to be an unidentified Android device, with each open to a spreadsheet. Each of the rectangular phones only shows two or three columns, while the Passport looks to have a whole worksheet onscreen. One does have to wonder how the rectangular phones would fare if their users just tilted them sideways, but Young says the Passport's square form factor makes it so there's "no more worrying about portrait or landscape modes." He further claims that the extra-wide screen offers a better reading experience for e-books and other documents, because it can fit more text horizontally. The typical smartphone screen is only about 40 characters wide, Young said, but the Passport's 4.5-inch screen can fit around 60 characters, which is closer to the printed-matter ideal of 66 characters. That in turn makes it easier to create documents on the Passport, he said, and the large screen real estate also makes the device appropriate for viewing documents like architectural plans and schematics. As bullish as it is on square screens, however, BlackBerry isn't putting all of its eggs in that basket. The Passport is just one of two new devices it plans to release this year, the other being the more familiarly-styled BlackBerry Classic in November. It could be the do-or-die moment for BlackBerry in the smartphone business. Its most recent handsets have sold poorly, leading it to take an astonishing $4.4bn inventory writedown on unsold handsets in December 2013.